Where did we leave off? 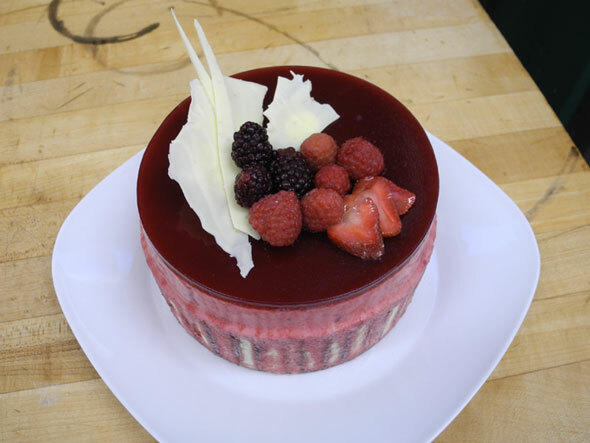 Ah yes, a few weeks back Kevin and I were doing Cakes Week of the Pastry II, our first station in the rotation. 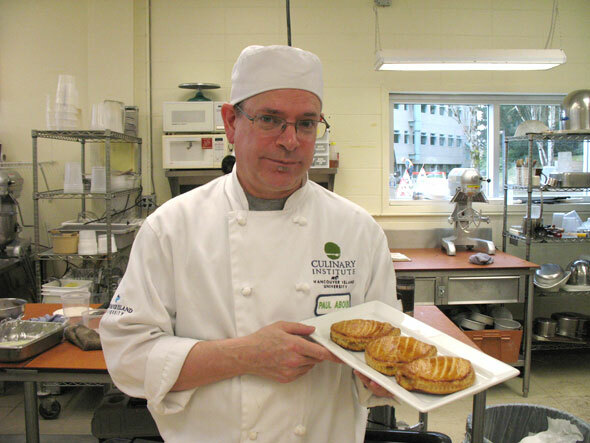 The following week saw us on Ovens duty so nothing to discuss or show here except to note that we made sure the ovens were running smoothly and all the required product was being baked and sent off to the upstairs and downstairs cafeterias as needed. That was week 2. 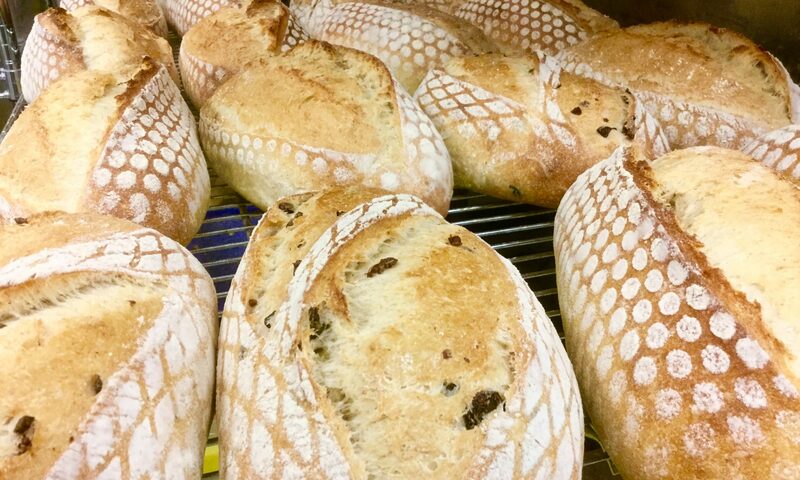 I’d point out here that we really did plow through this (as we have all other stations in the Pastry or Bread sections) even though we are the only 2-person team. Not sure if this hobbled team situation is being noted in our marks; we’re managing to keep up in spite of having 33% less manpower than other teams. The photo? Just a little fun around the oven with Sara and Josie. Figured this was better than a photo of the oven baking stuff. 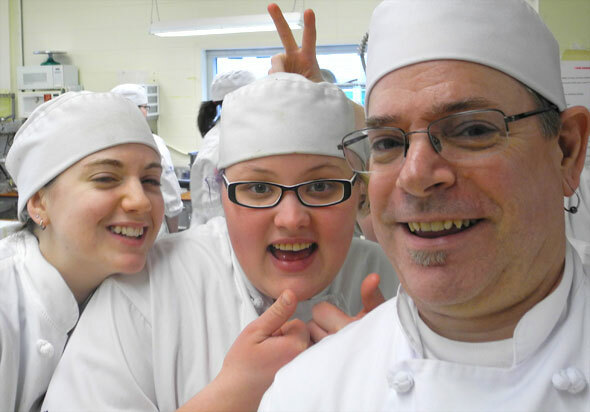 After Ovens came the Deserts section which consisted of producing Mousses, Puddings and a German Dough (sweet tart dough) and a Mousse cake, while still making sure regular bar productions (Nanaimo bars, etc.) were kept up. I chose to produce a bread pudding but used cake scraps instead, adding cranberries and bun spices. I made up a base of the German Sweet Dough and filled it with a cherry and coconut filling. For my cooked pudding, I made a chocolate version topped with Crème Diplomat. For my cake I made a Charlotte aux Framboises (raspberry), shown bellow. 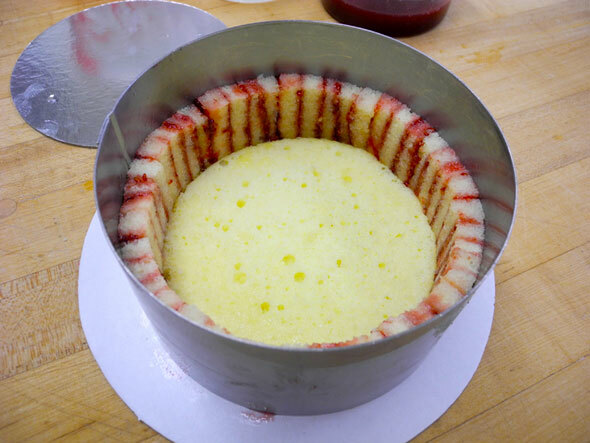 Process: A cake ring is filled with a border of cake slivers “glued” together with raspberry jam. In the center is places a smaller round of cake for the base. 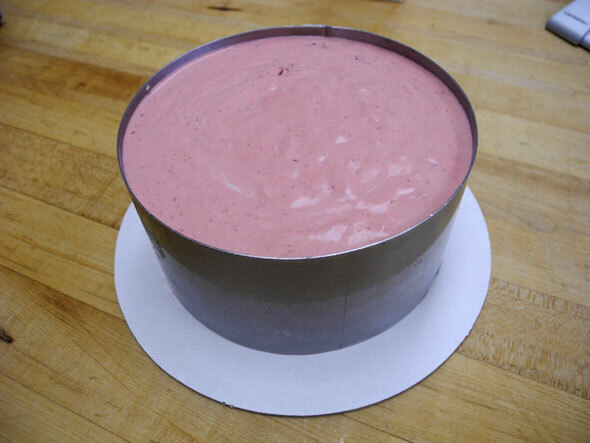 A raspberry mousse is made up and the ring is then filled to almost the very top. This is now refrigerated and allowed to set. 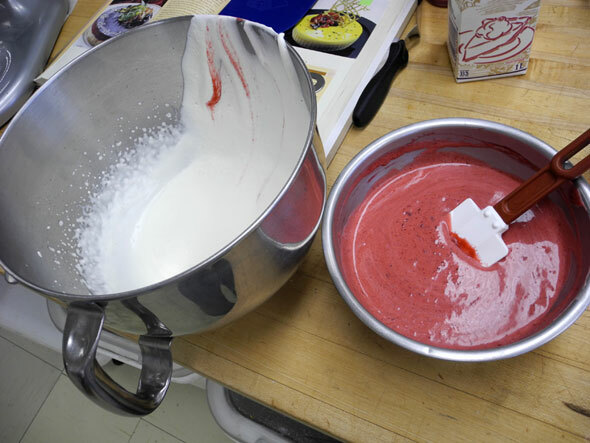 Once the mousse has solidified, a final layer of fruit glaçage is added to the top and, once this has again set, the ring is warmed up and slipped off. The final cake is ready for garnishing, in this instance with raspberries, blackberries, strawberry slices and white chocolate decorations. For week three, a short week as we were heading off to paris on Thursday, Kevin and I were on the Savoury station. As had been done in the Pastry I section, we had to produce a lot of meat pies, enough to supply the caf while we were away. I also made a hundred or two Sausage Rolls. Not exactly exciting but here’s a three steps in one photo. 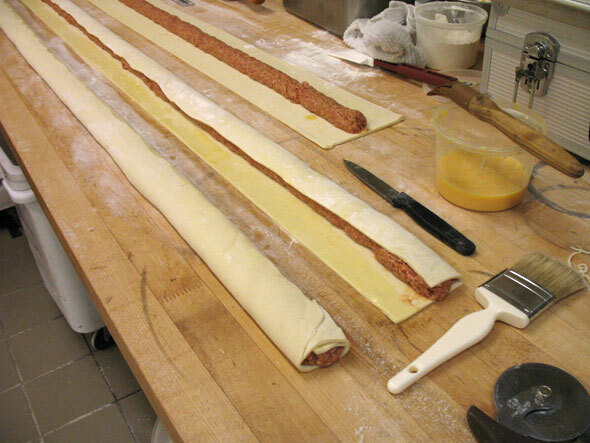 After making the puff pastry (yes, we make it ourselves) a ground meat and spice filling is piped onto a length of pastry so it is about 3 cm wide and thick (top). 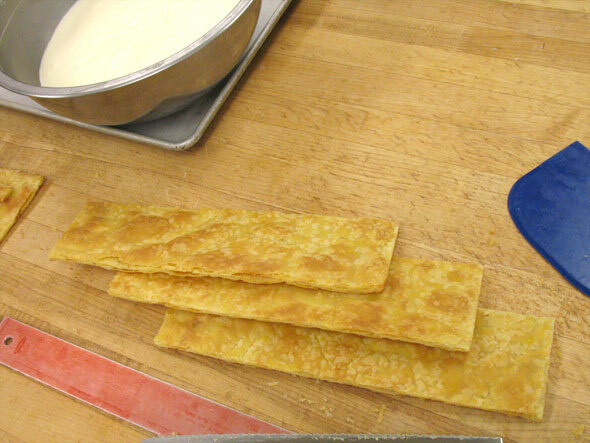 The pastry is then folded over the filling and the bottom edge is eggwashed (center). This edge is then wrapped up and over (bottom) and the long rope is then cut into 12 cm lengths. At this point, we froze the above (I made this same amount twice) to cover our absence. Once thawed, they are egg washed, baked until golden brown and crispy. Unless you’re vegan, you would likely find these surprisingly tasty. It’s all in the spices, doncha know. Then we went to Paris for two weeks. On our return, Kevin and I were into the Puff Pastry section. Here we had to make six individual (or one large) fruit pies and six custard or chiffon pies as well as a dozen eclairs. 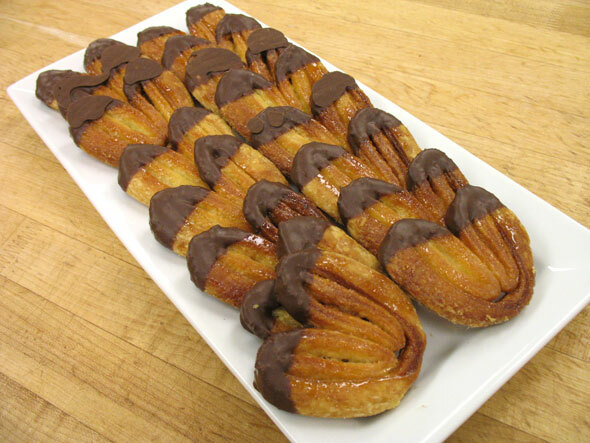 We also had to make a puff pastry such as cream horns, Paris Brest, Pithivier, or St Honore. 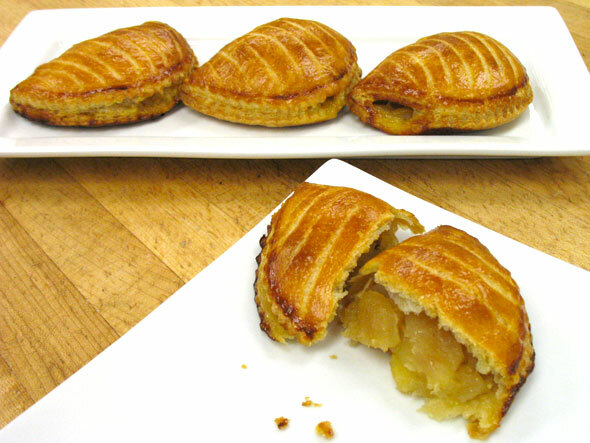 For pies, I chose to replicate the delicious Chausson aux Pommes (apple turnover) that we had seen and tasted in Paris. For custard, I selected a lemon curd tart, also enjoyed on our trip. For the puff pastry, I made some Napoleons. The eclairs turned out alright, save for issues with the Crème Diplomat which, for some reason, would simply not stiffen up correctly. I made a second batch for the Napoleons the next day and that worked perfectly. I also noticed that the gelatin sheets the second time around stayed in sheet form after soaking, where in the first batch they disintegrated in the water so now I suspect something had gone off in the sheets I used. Ungelled gelatin would certainly mean soft and soggy diplomat. 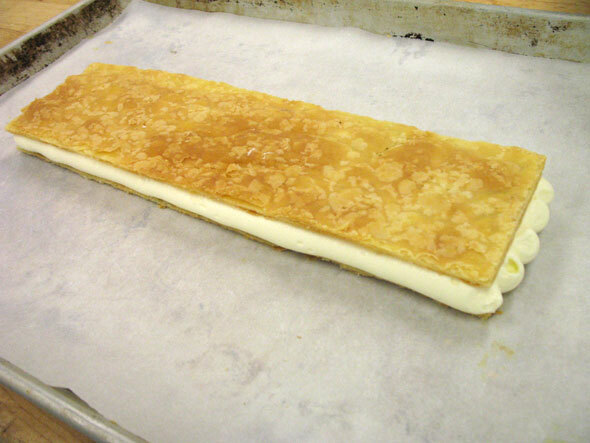 I continued with the puff pastry work and made the Napoleons. 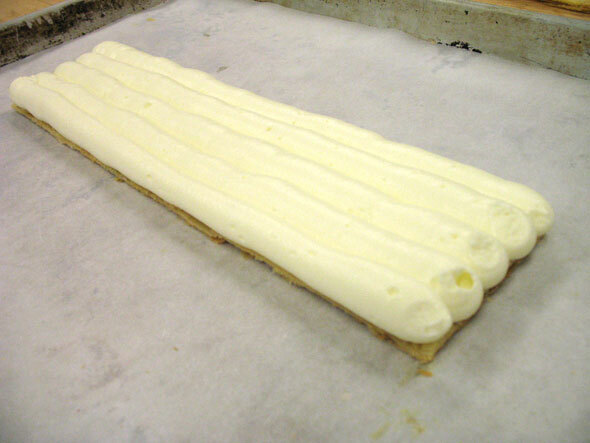 Process: bake a sheet of puff pastry large enough to be able to cut out three layers of a size to suit your needs. Here I have cut rectangles 10 cm x 24 cm which, when cut, will give me 6 Napoleon slices. 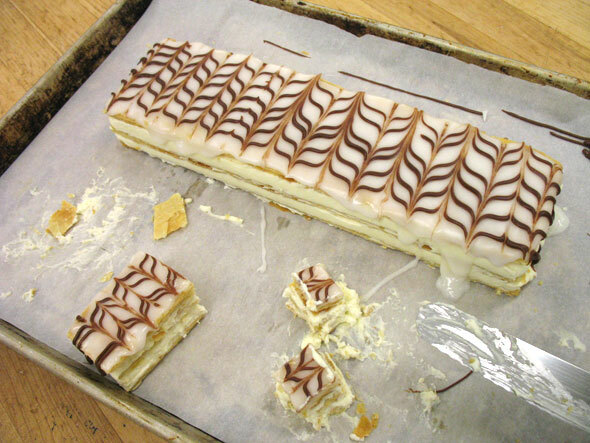 Update: Seems the morning class went ahead and sliced the Napoleons without me around so I have no final photos. Pipe your filling (here, it’s Crème Diplomat) onto the base sheet; top this with the middle sheet, this is a good place for a sheet that broke. Pipe more crème and top with your best flat sheet to finish. Refrigerate until the crème is quite solid. Cover the top with a white fondant then pipe several chocolate lines across the top while everything is still a little warm. Immediately run the back of a knife across the lines in one direction then again in the opposite direction to make the distinctive pattern. Allow to cool. Here we had to put the pastry aside until the next week as we were at the end of the Pastry section. This will be helpful as you do want some of the moisture from the crème to seep a little into the puff pastry and make it a little softer and less brittle to make cutting the slices a little easier. These are actually rather easy to do. Simply take a length of puff pastry, coat very, very generously with sugar (more than I used here is advised) rolling to embed the sugar as much as possible. 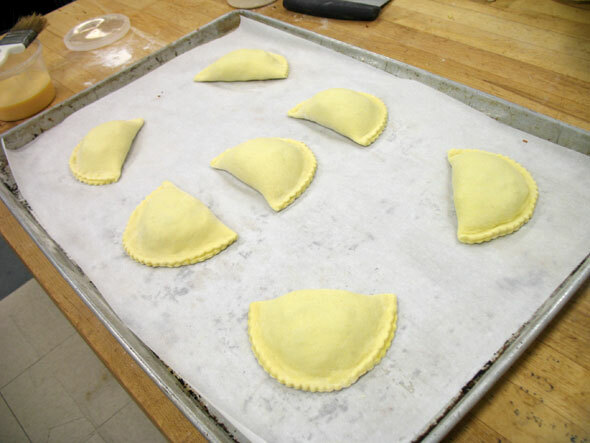 Then fold the outsides in to 1/4 of the way, then 1/4 again and fold the two halves together. bake until golden brown and the sugar caramelizes. Flip over to complete baking. Once cooled, serve as is or dip the ends in some melted chocolate. And that covers the Puff Pastry section. Next week: Quick Breads. I just love reading back over your blog. You know, I keyed in “bread blog” in Google and yours was third from the top. I took that as a sign to browse again. Very impressed by how much you’ve learned. Great post. Looks like a lot of pre planned plans you have. 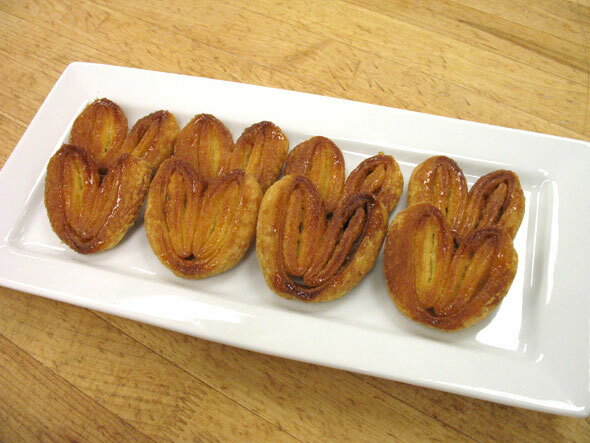 Your pastries look really nice and delicious. I really like the chocolate cake as well. What happened to you? I loved following your blog. I wanted to see how you went at the end of your course as I’m interested in attending. Please come back and post.